All transactions are safe and secure with a reliable history in online purchasing behind each of our associates. Buy the Snake Eyes / Storm Shadow G.I. Joe t-shirt to own G.I. Joe clothing and merchandise. This black G.I. 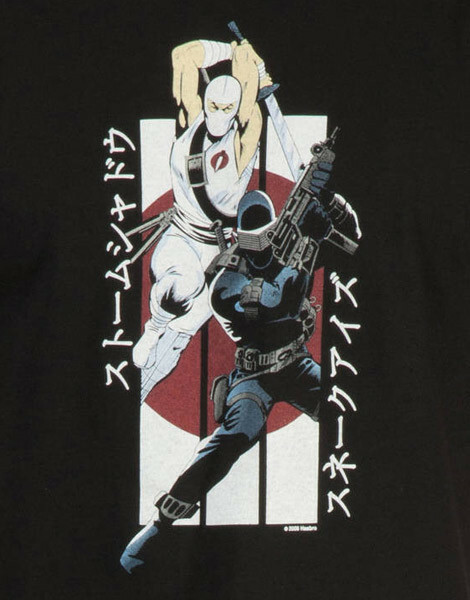 Joe tee features an exclusive action packed design that includes the ninjas Snake Eyes and Storm Shadow. Both characters, who were former comrades in Vietnam, are featured in the Larry Hama comic book and the G.I. Joe A Real American Hero cartoon. They were also included in the 3 3/4-inch G.I. Joe action figure line that hit toy store shelves in 1982. By 1985, with the help of the G.I. Joe cartoon and the Larry Hama comic book, G.I. Joe was ranked as the top-selling American toy, and these figures were two of the most popular. Add this tee to your collection of G.I. Joe clothing. In addition to the Snake Eyes / Storm Shadow G.I. Joe tee above, browse the G.I. Joe Clothing Gallery for more apparel like men's and women's clothes, kids shirts or hoodies.